Kingman Spyder MR100 Review - How Good Is This Painball Gun? When it comes to paintball guns, you have to do your due research, to make sure that you get a gun that is accurate, reliable, easy to maintain, and meets every other expectation that you desire from your paintball gun. A popular gun that you should seriously consider, is the Kingman Spyder MR100 marker. The Spyder MR100 is a great gun to consider, because it is perfect for both beginners and experienced paintballers, because it is very accurate and light, which are two important factors when considering a paintball gun. It is also a very safe gun to use, which is a great advantage for a beginner, because it has a solid structure, and is made of durable materials, so there aren’t any parts that are flying around, that can cause unwanted injuries. 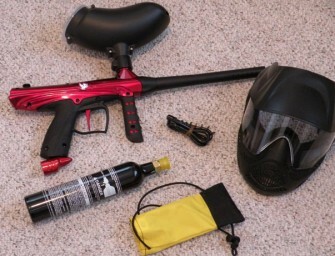 The gun is also very affordable, which is great, especially if you are just starting out, because there is no point buying an expensive marker that you can’t properly handle or maintain, especially if you aren’t sure how serious you are about paintball. It is better to start with a cheaper marker, then work your way up to the more expensive ones, the better you get at playing the sport. It is very important that you check out reviews from people who have bought a product before you decide on buying it, because it gives you the most accurate information about the product. Since we are trying to conduct a thorough review of this paintball gun, we have surveyed the reviews of other people who bought it to help you determine if it is the right paintball gun for you. These are the common advantages that they gave. It is a very accurate gun. The marker has a very smooth shot, with minimal recoil. It is a lightweight gun, but very powerful. It can be bought with a starter kit, that includes a fog proof mask, and visor, a 20 ounce CO2 tank, heavy duty paintballs, a paintball harness, and gold cup oil. The gun shoots very accurately, but it sometimes comes out slowly. Kingman Spyder MR100 is made by the Kingman group, which started making paintball guns and accessories in 1992. They started with the Hammer pump action marker, and after that, they came out with the revolutionary Spyder semi automatic markers. Today, they are considered one of the top paintball manufacturing companies, and they are known for making affordable paintball guns, that are also very durable, and they have helped make the game more popular with their quality products. As a beginner, there is no reason to spend obscene amounts of money on a top of the line paintball gun that won’t do much of a difference for your game, and is also hard to maintain, especially if you don’t have the experience. You are better off buying an easy to use marker, that is also pretty easy to clean. You will be hard pressed to find one as reliable and affordable as the Spyder MR 100.